Labor for Love, 11″x 14″, oil and acrylic (Copyright 2015, Shauna Wiley-Naefke. All Rights Reserved). This month, I return to the artwork of Bay Area artist, Shauna Wiley-Naefke (see also last month’s post on Wiley-Naefke’s Birth Partner). 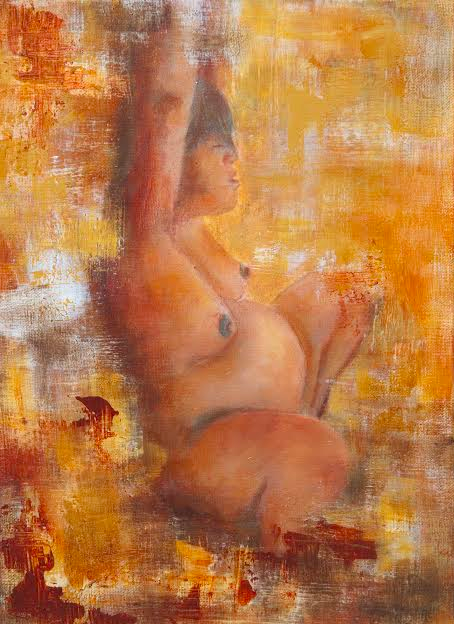 I am excited to say that Wiley-Naefke’s paintings, including Labor of Love and Birth Partner, will be part of an exhibit that opens next week in Berkeley (Birth Rite: A Visual Celebration of Birth and Pregnancy as a Rite of Passage). Painted in vibrant tones of gold, yellow, red, brown and white, Labor of Love shows a laboring woman who concentrates in the squatting position, arms raised above her head. The image exudes a sense of strength to the viewer, not only through the powerful form of the main figure, but also through the rich colors that blend dynamically with her body. The painting is a wonderful piece for pregnant women to use in the visualization of birth. Wiley-Naefke used a photo as reference when painting the laboring woman. In our correspondences, the artist has explained that the figure reminded her of a woman birthing in a field, on her own, as has been done in many cultures and historical contexts. “Primal, fearless, peaceful” is how Wiley-Naefke describes the birthing figure, and this description can be helpful to others as they prepare for birth. In her Guide to Childbirth, Ina May Gaskin often brings up similar words to help women understand the transitioning (mental and physical) that will take place when they give birth. Tapping into the primal self can be beneficial during birth. Shauna Wiley-Naefke is a Bay Area artist located in Alameda, California. In addition to her own experiences with birth, she has attended other births as a doula. Wiley-Naefke has shown her work in California and has a special interest in painting scenes of pregnancy, birth, and babies. Commissions of these and other subjects are welcome, and the artist is also always in need of models to take pictures of for her work. More of her artwork may be viewed through her Facebook Page and she may be contacted through email at: s.naefke [at] gmail [dot] com.